For January, I thought we would profile a feel-good movie, this time with Jennifer Lopez in the starring role. 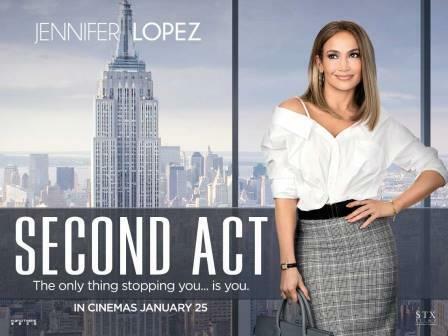 If you liked her in ‘Maid in Manhattan’, the chances are you will like her in this film – Second Act. As the film title suggests, this is all about getting a second act in your life, not accepting that your life must follow on the trajectory you imagined. In the film Maya (played by Jennifer Lopez) is a 40+ year old woman, who is frustrated that she has not achieved more in her life. She has a job working in a value store, she is very good at her job, but she gets passed over for promotion as a result of not having a college degree. Which just adds to her frustration. But maybe her life is about to turn-around! Her friend Joan, played by her real-life friend Leah Remini, secretly sent off an application to a highly reputable company called Franklin & Clark on Madison Avenue – so far so good, except Joan may not have been completely truthful about her friend’s education background! The question is, will she own up and tell the truth or run with the opportunity and prove that ‘street smarts’ are just as valuable as ‘book smarts’, and that it’s never too late for a second chance? As you might expect of this romantic comedy, it is directed by Peter Segal known for his work on 50 First Dates and Get Smart. Jennifer Lopez and Leah Remini are joined by Milo Ventimiglia and Vanessa Hudgens. The relationship between Jennifer and Leah has been hitting the spotlight, Leah has of course had a long-standing acting career, but has recently been known for her outspoken criticism of the religion Scientology since leaving. As well as being the main star in the film, Jennifer is also one of the producers, and as an added element she got to direct her ten-year-old daughter in a video for a song that is on the soundtrack called Limitless – about not having boundaries.